Don’t have a lot of money? Wonder how to put a little romance in your marriage when you can’t afford a dozen roses, a fancy dinner out, or a movie and popcorn? Well, go “old school.” “Old school” romance often costs very little and still packs a punch! In fact, this “old school” romance tip will only cost you time and attention; but, in spite of the low cash expenditure, the dividends are amazing. It’s really simple, too. What is it? Go for a walk. Hold hands and go for a walk. 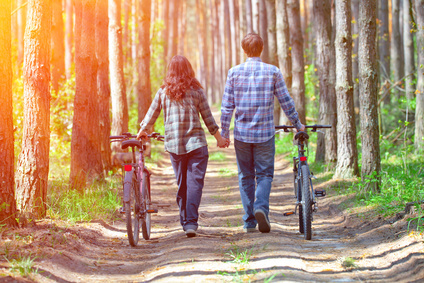 Seriously…check out these surprising ways in which going for a walk can benefit your marriage. Going for a walk will increase symptoms of physiological arousal, symptoms like a slightly racing pulse, a subtle shortness of breath, and, if you walk up a hill or at a brisk pace, a minor case of the sweaty palms. These symptoms mirror the symptoms of romantic attraction. At least one classic study (Read the abstract here) suggests we attribute symptoms of physiological arousal to romantic attraction under the right circumstances. Walking with your spouse presents those “right circumstances.” So, going for a walk can make you “fall in love” all over again. Walking together helps increase the bond you share with your spouse. You and your spouse have to match pace to walk together. Couples tend to subconsciously mimic their partner’s steps and pace. In doing so, you increase your sense of attunement with your spouse (See Mimicry in Social Interactions for more). More attuned leads to a deeper bond; a deeper bond leads to greater intimacy in your marriage. If you decide to increase your walk to a more challenging run or ballroom dance, you may find even more romantic benefits. Researchers discovered the physiological arousal of “invigorating activities” engaged in together led to greater feelings of satisfaction and romantic attraction (For more click here). In other words, your marriage becomes more satisfying and more intimate. Sounds good to me! You will also get in better shape. Exercise is good for us. And, let’s face it; we are attracted to those who take the time to increase their physical health. Don’t forget…you also increase your intimacy by interacting with one another as you walk. Talking to one another. Tell one another about your day. Share your thoughts and feelings. Talk about the news. Talk about your dreams. Each discussion increases your feelings of love and connection. See what I mean. That “old school” romance got it going on! You can renew your sense of romance, build a closer bond, get in shape, and share intimate conversation all with this one “old school” romance activity. So, grab your spouse by the hand and get on out there and take a walk. Oh, but before you do, enjoy this “old school” song that talks about the joys of “walking” together.